The base card design is excellent, the layout and foil lettering is reminiscent of past year's of base Upper Deck football, the card stock is reminiscent of 90's Flair and the overall card design features aspects from mid-late 90's Stadium Club. There's something extremely appealing about the futuristic look and flow of the card design. Where the card design falls short is with many of the hits, they often feel thrown together and feature a fairly weak relic selection, but that's too be expected from a product that carries a box price of under $100. As I noted above, by far the best part about Prime is the numbered base rookies. Each base RC is numbered to 999 and gives Topps a non-auto base rookie that should compete with DonrussElite and Classics in terms of value. Another cool feature of Prime's checklist are the themes used for the multi-player cards. Each has a uniting theme described on back of the card such as "Florida Gators' Passing Attack", "Complementary Running Backs" and numerous other intriguing combos. The checklist is also organized in an extremely interesting fashion, featuring 1st through 4th quarter combo relics and 5-levels of prime parallels. Topps Prime is a sneaky valuable product in my opinion. At first glance, it doesn't seem like the product as a whole would garner much value, but anytime you number base rookies, you will ultimately have set builders and value outside of the hits, which is key when determining the overall value of a product. Another nice thing is that the product delivers 4-hits via 10-packs for under $100. The interesting relic combos could bring some surprise value to product's memorabilia cards. Overall, the hits are somewhat lacking at times, featuring weak relics and unappealing presentation, which is bad news for the lesser rookies in terms of value. The overall presentation of Topps Prime is both intriguing and exciting. I am a huge fan of 10-pack boxes, as they offer the perfect amount of cards. What I enjoyed most about Prime was that it felt both fresh and familiar at the same time, there's something really cool about the themes and card design. The hits were a bit disappointing. 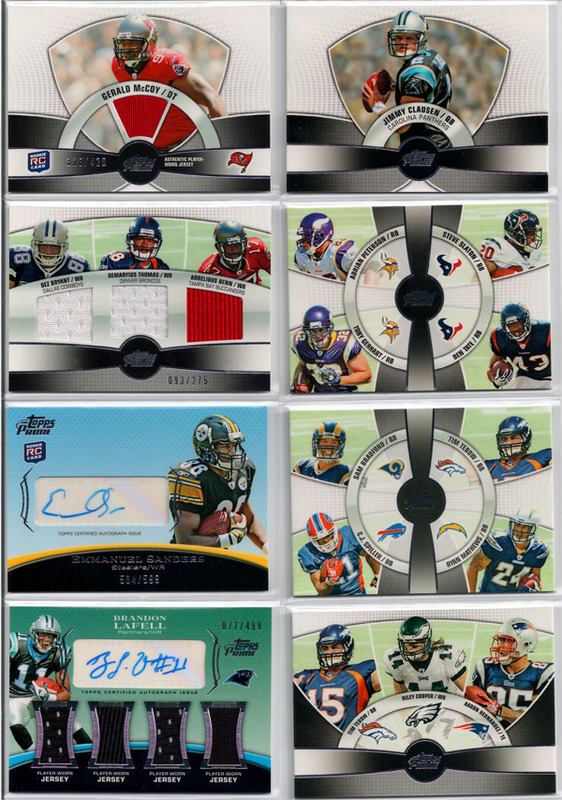 For a first year product, Prime makes for an intriguing box break and is a product to keep an eye on in coming years. In the last couple of weeks, Topps has quietly released two first year football card products, one of them is good, one of them is not. 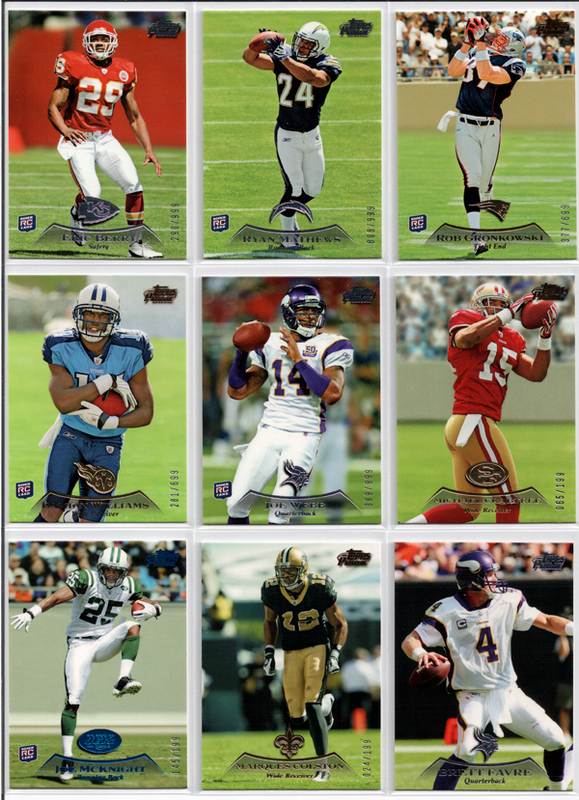 The two products I speak of are 2010 Topps Unrivaled Football and 2010 Topps Prime Football. The product featured in this review is the good new Topps product, that being Topps Prime. The best part about Prime are the numbered base rookies, which add substantial value to the product. Topps Prime features excellent base card design and represents a step in a refreshing new direction for Topps. In it's freshman campaign, Prime gets off on the right foot, with a few tweaks and improvements it could be an excellent product for years to come. Prime is an interesting change of pace to Topps' "chrome" based products. Overall, 2010 Topps Prime is a solid product that I would definately recommend looking into if football is the focus of your collection. Each $90 hobby box delivers 10-packs, 4-hits and a host of numbered rookies. I pulled a numbered Tebow out of retail? @Randy Le: What was it numbered to? @Brett J. Lewis: Also, was it numbered on front or back? I know the Bronze retail Parallels are numbered to 1,200 something. I really wish Topps would release information like this, each product is like piecing together a mystery at times. Hey Brett, sorry it took me so long to get back to you. Yeah it was a bronze parallel numbered to 1379 lol. Numbering was on the back. Retail is a lot thinner than hobby as well. Are you kidding? This product has no redeeming quality or value what-so-ever! Topps should be extremely ashamed of themselves with this product. I saw a Tony Romo/Dez Bryant dual jersey pulled, and it was a 1/1!!!! No patch, no nfl logo shield or nothing. Just a single colored, dual jersey. It’s like topps took the remaining scraps from their 5 Star product, slapped a product to it and called it prime. I have YET to see a decent patch be pulled out of this stuff. Your review numbers (although your opinion obviously) are WWAAYY too high. Bottom Line – 4.1/5. In my opinion, it should be reversed. 1.4/5. Topps should be embarrassed and ashamed for releasing this product. @Joshua: Ha, have you tried Unrivaled?